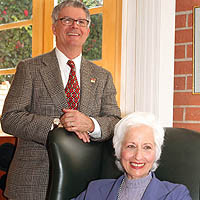 John Wolcott and Florence Clark are co-masters in North Residential College. When professor Michael Waterman was an undergraduate, he lived in a dorm for one brief academic quarter. Now, decades later, he’s making up for lost time. Waterman, a renowned professor of computational and molecular biology, has lived full-time in Parkside Apartments as a faculty master for the past three years. He eats at the International Residential College dining hall, attends dorm council meetings, hosts weekly discussion groups in his larger-than-normal apartment and shares typical college dorm life experiences, with a few exceptions. There’s no white board with scribbled messages on his doorway and his apartment comes with a washer and dryer, meaning he doesn’t have to risk laundry roulette with the coin-operated machines. USC has a small, but growing, residential faculty program, with 19 professors and their families living in dormitories and apartments throughout campus. Among the passionate advocates for the program is professor Florence Clark, chair of the department of occupational science and occupational therapy, who is the faculty master in North Residential College, along with her husband and co-master, John Wolcott. The two live with their 15-year-old cat, Rocket, in a tasteful three-bedroom suite at the end of a long hallway of rooms belonging to male freshmen. Eight dorm rooms were converted to create their apartment. A patio, with its year-round twinkle lights, is just across the courtyard from that of political science professor Stan Rosen, who is the faculty master at New Residential College. Clark, who will have taught here for 30 years in August, has been a longtime proponent of faculty members living on campus. She and Wolcott have lived at USC’s former Embassy Residential College downtown, the McCulloch Townhomes just north of campus, and have been living at North since January 2002. They raised their daughter, now an adult on her own, in residential housing since age 9. Every fall, she and Wolcott teach a two-credit class for freshmen, Introduction to Occupational Therapy, in their living room, with its deep sofa, leather club chairs and area rug. “It looks like home, which makes the students happy,” Clark said. They allowed a visitor to attend the last class, which was notable for the intellectual rigor of the discussion, the quality of the readings and the close-knit feeling of the group. Clark and Wolcott said it is not unusual for former students and former resident advisers � whom they help select and work with closely � to return to visit them after graduation. Students also bake in their kitchen, help trim their Christmas tree and occasionally borrow their guest room. “I like these young people � their idealism, their innocence, their enthusiasm,” Clark said. Every Wednesday, students in North Residential College are invited to a more formal dinner, with tablecloths and cloth napkins in a private dining room in the complex. Clark and Wolcott always invite several faculty and staff members to join them. This is USC’s version of “high table” at Oxford University, where students study and live in the same college. The entire residential masters program was modeled after the British version, and was championed by history professor Kevin Starr, who had lived in a similar residential/academic house while at Harvard. The Wednesday dinners attract as many as 110 students out of the 280 who live in the dorm. “They’re really craving episodes of formality,” Clark said. A few Wednesdays ago, freshman music major Riley Karp set a gracious tone by playing piano as people ate. The theme was “preppy night,” with students dressed in all the Topsiders, pastel shirts, headbands, chinos and argyle sweater sets they could muster. With dessert, there was a “preppy parade,” with Clark, Wolcott and guests awarding prizes to the most authentic outfits. The couple gets closely involved with the students in their dorm, worrying that one’s GE classes are too large or sympathizing with another’s personal setback. They both said it is vitally important, especially in a student’s first year, to become connected with the university and individual faculty members. Macarena G�mez-Barris, professor of sociology and American Studies and ethnicity, lives in Parkside Apartments with her husband Roberto Leni, a writer and stay-at-home dad, and their children, Renato, age 2 �, and Ixchel, 10 months. Theirs is one of three families at Parkside with young children. Students seem to appreciate having children in the residences, G�mez-Barris said, an observation echoed by Parkside sophomore Brian Dumbacher, who said he enjoyed seeing youngsters “running down the hall with their toys” when he came back to his room after class. Denzil Suite, assistant vice president of Student Affairs and executive director of the Office of Residential Education, oversees the residential faculty program, which has faculty in most freshmen residence halls with the exception of Pardee and Marks Tower, which do not have faculty apartments. Faculty also live in other residential buildings throughout campus, and new faculty quarters are being included in the Parkside residences under construction. Suite and Amanda Ebner, the diversity coordinator in his office, also oversee the Faculty Staff Mentor Program, where professors and staff members are assigned to a particular residence floor or residence adviser. These mentors go to dinner with students, accompany them to activities around the city and generally become involved in residential life. There are more than 6,000 students living in residence halls � including 98 percent of all freshmen � and more than 200 faculty staff mentors, along with the 19 faculty members living on campus.